-Banks was so confused at Jax referring to herself as weighing 300.5 ounces she flipped her lid. Homecoming was overall a very enjoyable PPV, however there had to be SOMETHING that would distract from their success and that would be the main event finish (the bit that didn’t involve the guys from Survivor). Maybe out of context it doesn’t look that bad but Cage and Johnny had been beating the hell out of each other for twelve minutes so for a weird school-boy thing to end it sucked. Eli Drake was unable to hog-tie Abyss in their No DQ match on the same show. Despite Abyss very politely holding his hands out for his pal. He’s very nice that Abyss lad. The ref for some reason restarted counting so Jeff had a chance to recover…to roll in and get choked out for real-real. Refs have the right to re-start a count if interrupted but the ref waited for Joe to come to him THEN restart to JOE WAS ROBBED (even though he won). This article is being typed up on the eve of NXT UK’s first supershow so lots is being typed and speculated about what this will mean for the UK scene. Whoever gets signed we hope WWE bothers to learn their name. On episode 24, the graphics alerted us to the existence of a third Coffey brother. 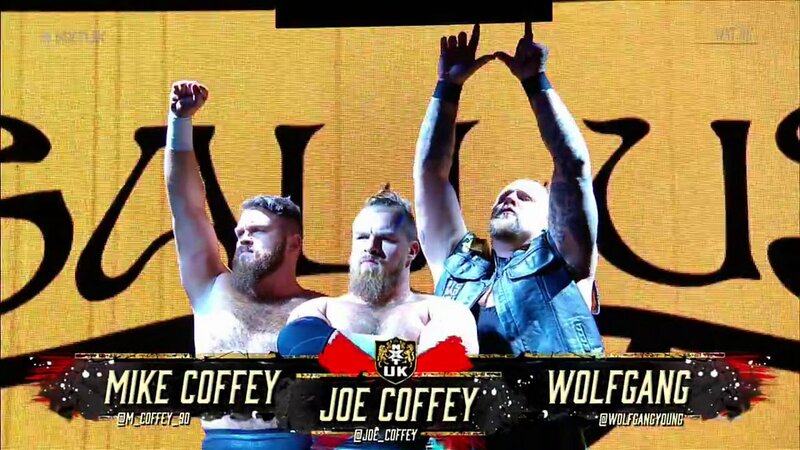 No not Wolfgang, the guy on the left is supposed to be MARK Coffey which will help him when there’s lay-offs and some guy called Mike gets pink slipped. I’ve been Maffew and you can follow me on twitter. I danced with the guy that edits these last week so hopefully this is formatted correctly.